There are many wonderful upsides to being an Artist-in-Residence at Lillstreet Art Center (LAC). 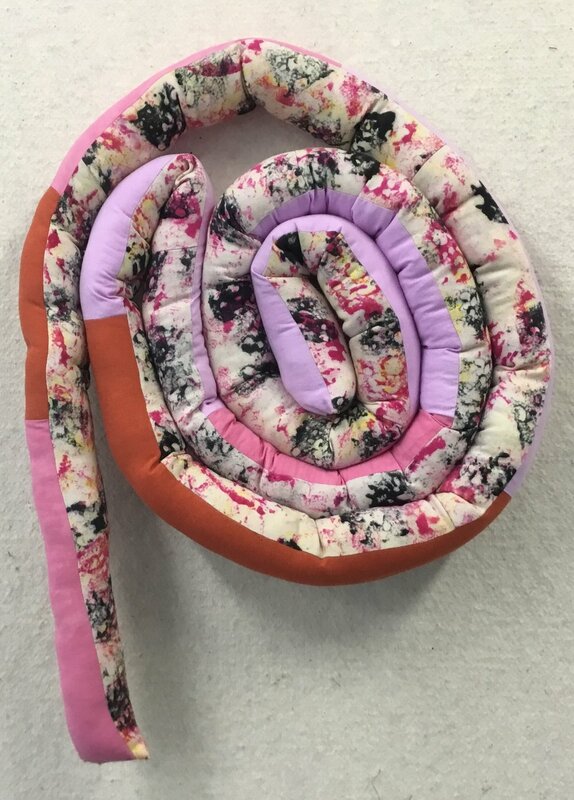 In addition to having 24-hour access to the silkscreen and sewing studios, which includes space to create, display and store my work, I can take classes for free at LAC in any department. 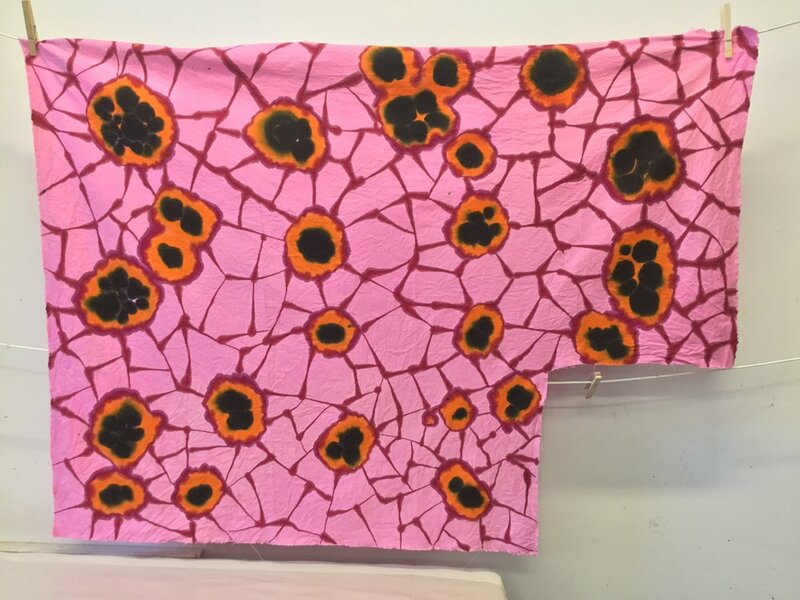 Though I have yet to take any classes outside of the Textiles department, I have had a full schedule taking classes in sewing, dye and print techniques. The faculty are thoughtful, talented professionals from diverse backgrounds and the ongoing dialogue with this community has contributed to my growth as an artist. I've spent the past six months thinking of my time as an artist-in-residence in the Textiles department as very similar to traveling abroad. I'm a bit out of my comfort zone, and the languages related to the media and methods are different from what I am used to. Sometimes I act like I know where I am and sometimes I really do know where I am. I began my studio work creating leaf-shaped quilts and playing with the formal aspects of the top and underside surfaces of leaves. I am interested in galls that form on leaves and the differences in their color and texture. My exploration of dye techniques on cotton/silk blends, mostly scarves, use dye to draw and paint textures and patterns to work out compositions for larger pieces. 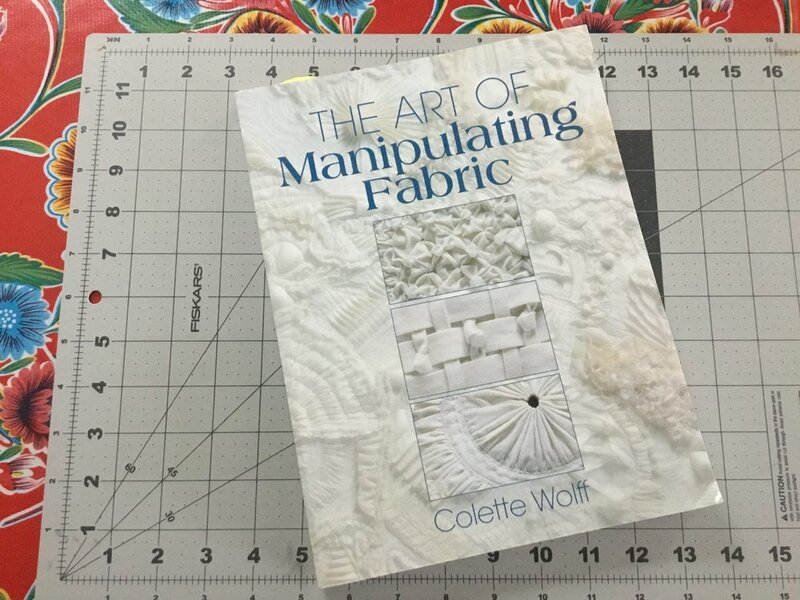 I've explored printing thinned dye on wet fabric and printing from carved styrofoam blocks to create surface design patterns. These new surface design patterns are then incorporated into three-dimensional objects. The designs are cut and sewn to create re-imagined pollen grains. 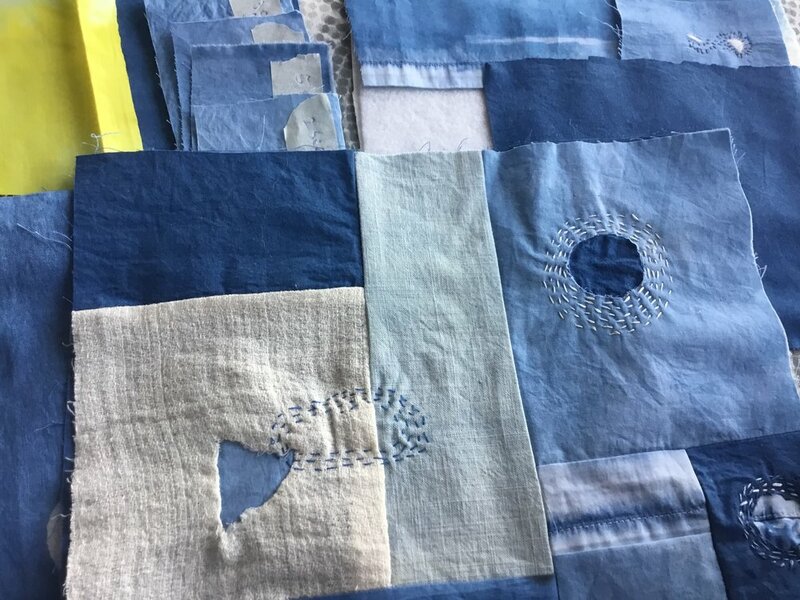 I have taken two classes with LAC faculty Akemi Cohn, Indigo dye with Katazome and Indigo dye and Boro stitching. Akemi is an excellent instructor and I have learned both about the historical and cultural aspects of indigo as well as the artistic processes. One of the joys of taking Akemi's courses is having a front row seat to the incredible samples and completed pieces she shares with her students. When I travel abroad I am constantly noticing similarities and differences while I navigate a new place: the palette, the architecture, texture, smells and sounds. I can't help but feel humbled by what I don't know. In this new terrain of textiles, I am struck often by all I have learned in such a short amount of time. The other day, while I was salivating over textiles at Oak Fabrics, the owner shared the name of the designer of these textiles, Kaffe Fassett. I had never heard of Fassett. The shot cotton textiles that I am especially smitten with, combine two different colored threads and have a depth and richness that reminds me of painted surfaces.